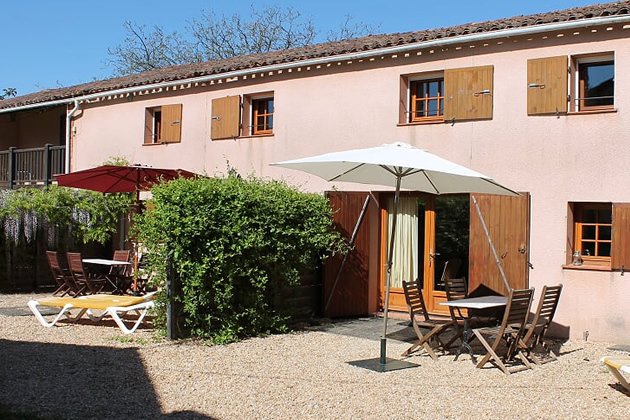 This self-catering apartment is detached and is suitable for six people. You have a cosy living room a fully fitted kitchen and three bedrooms. All rooms are on the ground floor. Originally functioning as the Dairy where the butter and cheese was made for the main house, this has been renovated to retain the old charm. 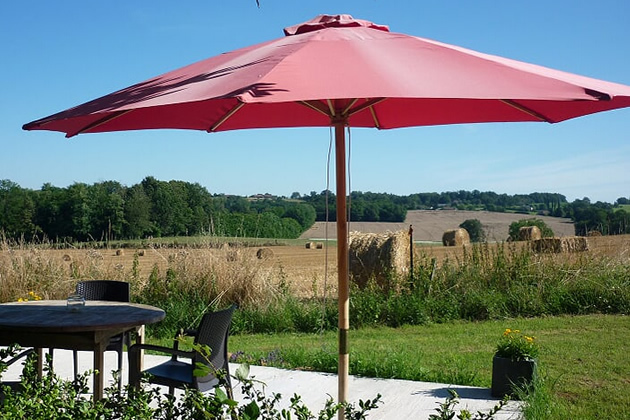 From your terrace you have a gorgeous view of Thiviers and surroundings. 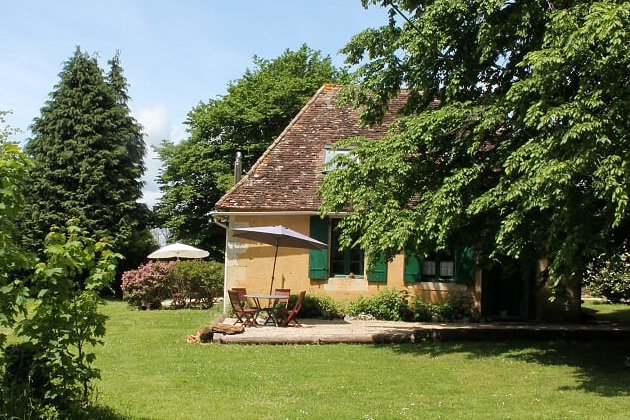 Is one of the two adjoining cottages that are built in a typical périgordian style. All rooms are on the ground floor and it sleeps six people. There is a spacious living room, three bedrooms, a bathroom with shower, wash basin and toilet. In the large kitchen you’ll find everything you need. The terrace provides a magnificent view of Thiviers and its surroundings. 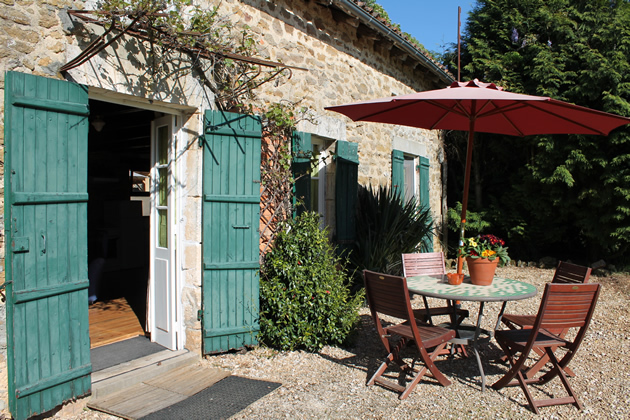 Gîte Périgueux is a pleasant holiday home accommodating five people. Inside you’ll find many authentic French details. It has a good size country style kitchen that is well equipped. A spacious living room, two loft style bedrooms and downstairs shower room. The patio offers you lots of privacy and shade for those hot summer days. This is the right of the three adjacent cottages and it sleeps four and was built on the foundations of the old dairy farm. At your right you have a lovely shaded terrace ideal for alfresco dining, while the front offers a sunny terrace. Inside you have a large lounge with adjoining kitchen. Upstairs are the two bedrooms and the shower room with bath/shower, wash basin and toilet. 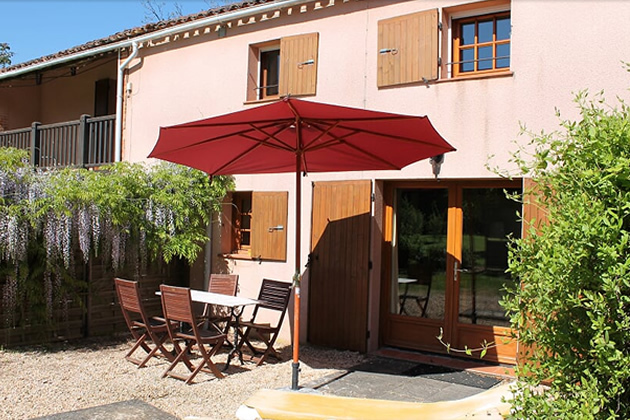 Holiday house Ribérac is the middle one of the three adjacent cottages and is also suitable for four people.In the front you have a sunny terrace where you can enjoy your fully deserved French sun! It has a spacious living room and a fully equipped open plan kitchen. On the first floor you have two bedrooms and the shower room with shower, wash basin and toilet. This is on the left side of the former dairy barn and is suitable for four/five people. There are two terraces, one in front and one to the side. The old rail of the former dairy train still runs in front of your door. On the ground floor you have a well facilitated kitchen, a comfortable living room and a toilet. Upstairs you will find the bathroom with bath/shower, wash basin and a second toilet, as well as the two bedrooms. One of which has a balcony that offers a royal view of Thiviers. When on vacation with a group of friends or several families, the last three cottages are very suitable. The luxurious, spacious safari lodge tent is equiped with all modern conveniences and private bathroom with shower, toilet and washbasin. The bathroom is situated right next to the tent. 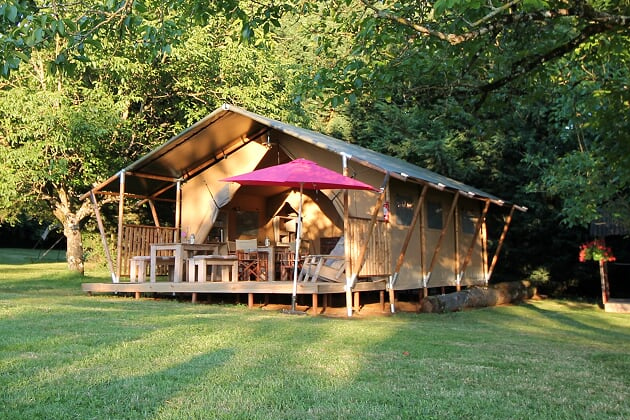 The attractively decorated tent consists two or three sleeping compartments, a kitchen unit, complete with inventory, a sitting/dining area and a large partly covered veranda. 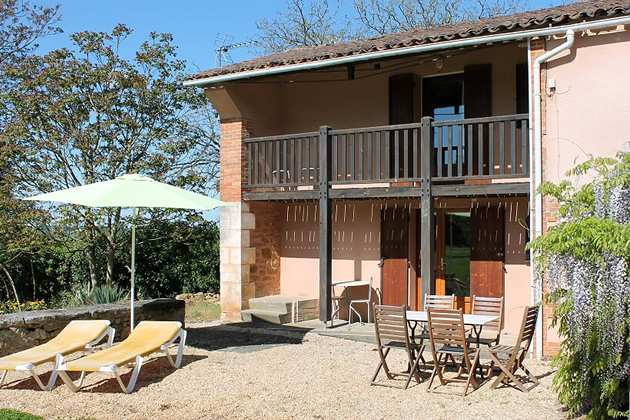 From your veranda you can enjoy a magnificent view of the domain and in the distance over the town Thiviers. This spacious cottage (60 m2.) is located on the left side of the main house. On the ground floor is a cosy living with a woodstove, bedroom with bunkbed and a fully equipped kitchen with washing machine and dishwasher. On the first floor is a very large master bedroom with a double bed of 1.80 x 2.00 and a sitting area. Also the bathroom with bath/shower, wash basin and a toilet. 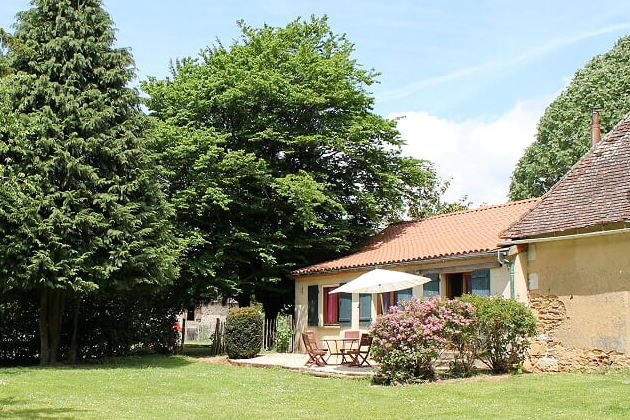 The wonderful view of Thiviers and surroundings and the beautiful sunset from your window is not to be missed. There is a terrace at the front of the house and a beautiful quiet terrace at the back of the house with a lovely view. 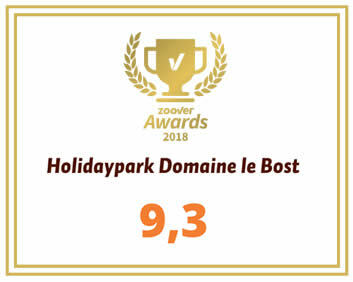 From the first of October till the first of June, the first floor of gîte Le Petit Bost will serve as a Bed and breakfast room.